This is a sponsored post. It also contains affiliate links. As always all opinions are honest and my own. Once upon a time, I used to be the hostess with the mostess. Everyone would come over to my not so humble abode for holidays, game days or just because they knew they could always find friends, food and a fun time. Since moving back to the Bronx and becoming a mom I have pretty much hung up my hostess hat, cue sad music. I have a lot less space and a lot more clutter in my current cozy dwelling which makes me less inclined to entertain. Even still I am into the holidays, love to decorate and look forward to invading other’s more spacious homes. I even offer to be part of the cleanup team. This season I am planning to bring my own Mean Green products with me to share the love and quicken the cleanup process. I know, I know, you have heard me rave about Mean Green for most of the year. I just hope by now you can check it out yourself so you can see how it can feel like a life changer. If you are the one entertaining this holiday season please consider this a PSA. Make sure when you are at the store picking up everyone’s favorite foods, snacks and drinks you remember to pick up your favorite cleaning supplies. Then nominate some of the little elves that live at home to help you get ready for guests. Mean Green Super Strength Cleaner & Degreaser – This is my go to. I love this cleaner. It takes no prisoners. It really does work great everywhere. I use it almost daily and even used this one over the summer for my cousin’s backyard grill. Holiday cleaning will be a piece of cake with this by your side. 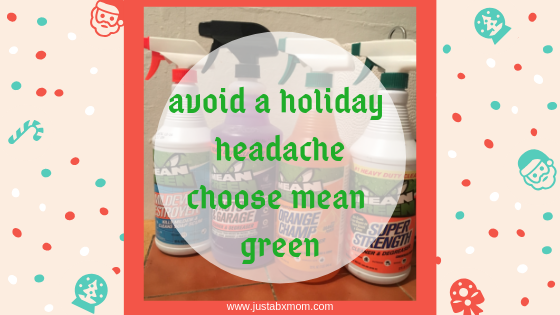 Mean Green Orange Champ Cleaner & Degreaser – This one is perfect for the holidays because it has a gentle scent. I even use this one in my laundry so it will be perfect for all of those holiday celebration stains that are about to happen when someone is asked to pass something at the table but instead knocks everything down. Mean Green Mildew Destroyer & Cleaner – You don’t have to worry about who uses syour bathroom if you’re cleaning with this! I think the germs and dirt get up and run when you bring this bottle into the bathroom. JustaBXgirl and I argue over who will get to be the first one to use the tub once I finish using this. It is a great way to prepare for holiday guests and to clean up after them. Whether you are planning to have a hundred people over or kicking everyone out you want a clean house. The best way to get that is to use products that get the job done thoroughly and efficiently. Without a doubt, I believe that is Mean Green.